Summer lovin’ had me a blast… Unless your love is your best friend’s boyfriend and you’re spending your summer desperately trying to forget he exists. 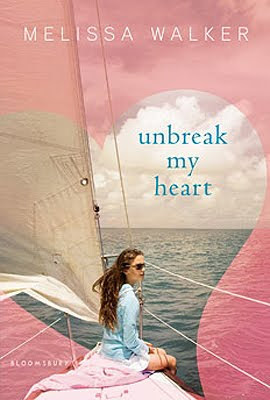 UNBREAK MY HEART is the latest by GCC member Melissa Walker and it’s the perfect mix of romantic drama, sailboats, and beaches. It just debuted this month through Bloomsbury and everyone should add it to their list of summer beach reads. As always, here’s a little bit about her book to get you hooked: Usually Clem would dread the idea of spending an entire summer sailing with her family—two parents, one annoying little sister, and no internet, all on one tiny boat; however, right now escaping her life on land sounds pretty good. Clem did something bad during her sophomore year, even though she didn’t mean to. She fell for her best friend’s boyfriend and thought that he was falling for her too. Now the school year is over, the truth is out and he’s been excused while she’s been exiled, leaving her with no friends and zero social life. When she and her family set sail the last thing Clem is looking for is another romance, but perhaps it found her anyway. His name is James. He’s cute, funny, and best of all, doesn’t know anything about her past. He and his dad are sailing the same route as Clem and her family for the summer and he’s just the distraction Clem needs. Can he break down Clem’s walls and unbreak her broken heart? Melissa: Yes! I had an awful friend breakup and I mined a lot of those emotions for UNBREAK MY HEART. Melissa: Finding an editor was harder–I had no clue about who I could work well with or how each publishing house worked… my agent I really liked instantly. Melissa: The aforementioned friend breakup had a lot to do with it… and I also spent a lot of time sailing with my parents as a teen. Melissa: I was actually on a trip with three of my best friends from high school when I heard that Bloomsbury liked the synopsis I’d written for this book and wanted to go ahead with the idea. It was great! We were on the central coast of California–in Morro Bay, to be exact–and we had mimosas to celebrate! Thank you, Melissa! Now, everyone go out and buy books, lots and lots of books!